Townhouse house plans, also called row homes, feature multiple residences that are fully attached on one or both sides of one another. Usually more than one-story, this style of multi-family plans also can be incorporated into a more urban setting because of its narrow style and taller stature. The Staunton Fourplex Multi-Family has 4 bedrooms and 4 full baths. 2840 Sq. Ft., Width 66'-6", Depth 35'-0"
The Countryridge Farmhouse Duplex has 6 bedrooms, 4 full baths and 2 half baths. 2986 Sq. Ft., Width 64'-0", Depth 50'-8"
The Pasadena Fourplex Multi-Family has 12 bedrooms and 8 full baths. 4240 Sq. 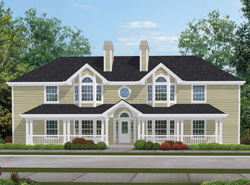 Ft., Width 80'-0", Depth 51'-8"
The Wayland Split-Level Fourplex has 8 bedrooms and 4 full baths. 3604 Sq. Ft., Width 59'-0", Depth 38'-0"
The Ashley Place Duplex Home has 6 bedrooms, 4 full baths and 2 half baths. 3258 Sq. Ft., Width 74'-4", Depth 47'-0"
The Marydel Multi-Family Triplex has 6 bedrooms, 6 full baths and 3 half baths. 4023 Sq. Ft., Width 54'-0", Depth 46'-0"
The Lehigh Multi-Family Fourplex has 8 bedrooms and 4 full baths. 3808 Sq. Ft., Width 48'-0", Depth 39'-8"
The Marland Multi-Family Fourplex has 8 bedrooms and 4 full baths. Townhouse plans can be a great choice if you live in a place where land prices are at a premium. We offer stylish townhouse designs perfect for building as an investment. Browse our collection of townhouses and find the best townhouse for your building needs.